Fighting myself to finish the button band on the Whirligig Vest. Armhole ribbing is done with one of the arms done twice. I don't really like the little specks in the bind off where the dark brown goes over the corrugated lighter color in the rib. Tried knitting one row of dark brown before I bound off but it looked too heavy. I think I can make out specks in the designer's vest photo - not that I have to do everything just like the pattern. Buttonband is picked up and started so it won't be long before it gets blocked. Pulled the colors out today for Ann Feitelson's Shirt Tail Hemmed Cardigan. I lucked out and found all the colors but two in local yarn shops. I'm okay with substituting #55 a sort of brick reddish for #1403 Barn red which is a bit more purplish. I couldn't find #S684 Deep Cobalt but it is only used for very few stitches once every 24 rows. I'm going to substitute a medium dark blue since that is the one that seems to still spark but goes with the color run okay. However there is a much brighter blue #18 which might be a better spark color though it looks a lot like the deep purple. See the two photos and look at the blue color on the far left. The balled blue (photo on the left) is the spark, the skein blue (photo on the right) is the one I think works okay. What say you?? 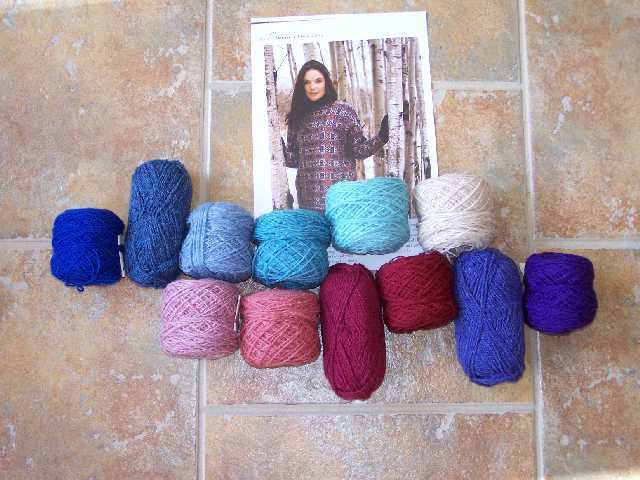 Also fighting self not to start an Aran sweater being done as a knit along at FLAK - http://bigskyknitting.com/FLAK/knitalong.html. Fair Isles are really growing on me but I do dearly love Arans. 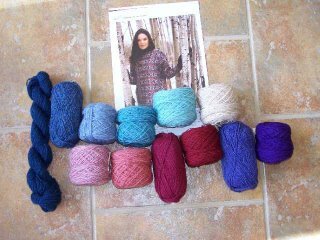 I did preview a couple of aran weight wools today to see what I liked but I'm going to keep slapping my hands - no no no. Possibly a foot of snow coming in for the weekend. Firewood stored by the fireplace, chicken cooking, errands all run so you know what I'll be doing while the snow blows - knitting.